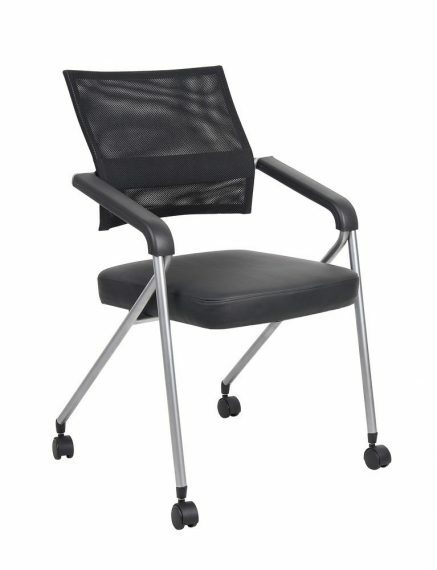 Seat upholstered in ultra soft durable and breathable CaressoftPlus™ and the back is upholstered in breathable mesh. Seats fold to allow chairs to nest together for easy storage. Dual wheel casters allow for easy movement. Sturdy metal frame with attractive pewter finish. Available in package of two chairs per carton. Steel back frame upholstered in mesh. Seat cushion upholstered in CaressoftPlus. Seat folds to allow chairs to nest together for easy storage. Dual wheel casters allow for easy movement. Sturdy metal frame with attractive pewter finish.